ST. GEORGE – The Concert in the Park 2013 Series kicks off Monday with a performance from local country heartthrob Eric Dodge. Dodge will perform Monday at 7:30 p.m. in Centennial Park, located at 301 North 2200 East in St. George. There is no charge to attend. Park seating is available; just bring a blanket or chair, food, family and friends. Sponsored by the City of St. George with funding from the Utah Division of Arts and Museums, the State of Utah and the National Endowment for the Arts, the Concert in the Park 2013 Series will run from May until September. 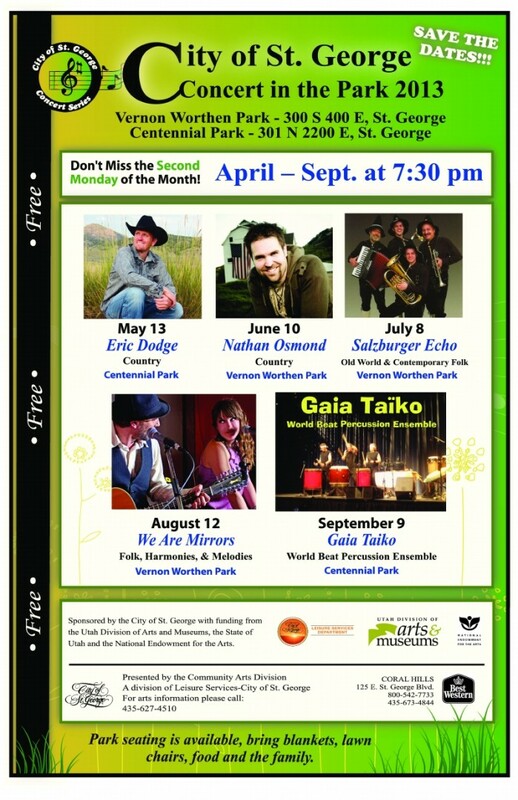 Additional concerts scheduled are country artist Nathan Osmond on June 10, contemporary folk group Salzburger Echo on July 8, folk duo We Are Mirrors on Aug. 12 and percussion ensemble Gaia Taiko on Sept. 9. All will be held at 7:30 p.m. in either Centennial or Vernon Worthen Park; a complete schedule can be found here. Southern Utah resident Dodge had long possessed a passion for music, but his greatest fear was to share that passion with others. That changed on Sept. 11, 2001, when America became the victim of a shocking and horrifying terrorist attack. Dodge was aboard a cruise ship in the Gulf of Mexico that day and was inspired to sing in an offering of hope to his fellow passengers. After his performance, one woman approached him and encouraged him to pursue a singing career. Just as many others were changed by the events of 9/11, he took her words to heart and decided to follow his dream of making country music. Since 2003, Dodge has performed hundreds of shows all over the United States and Canada. He has opened for many of Nashville’s finest country music stars including Chris LeDoux, Diamond Rio, Little Texas, John Michael, Montgomery, Justin Moore, Collin Raye, SheDAISY, Terri Clark, Julianne Hough and Carrie Underwood at the Stadium of Fire’s 4th of July Celebration in Provo in front of over 50,000 people. His first radio single, “Anything for You” was released in March 2006 and hit No. 9 on the New Music Weekly-Independent Artists chart. His second album, “Why Not Today,” reached No. 3 on the Amazon.com bestseller list and his album, “A Christmas Wish,” sold thousands worldwide in its first season released. Dodge continues to tour and record new original work and has released six full-length albums to date. When not on stage performing, Dodge can be found riding horses and four-wheelers or camping on his family’s ranch. He loves anything outdoors, including fishing and hiking. Summer, winter, spring or fall his favorite moments are sleeping outside by the campfire under the stars. From the brim of his hat to the tips of his boots, he is a true country boy.